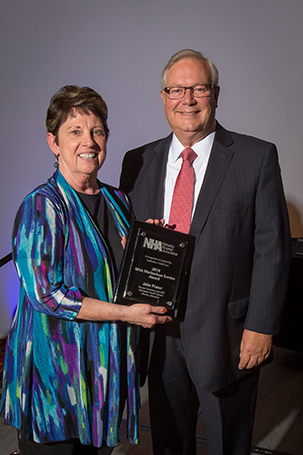 John Fraser, who joined Methodist Health System in 1991 and served as president and CEO from 2007 to 2017, was awarded the 2018 NHA Meritorious Service award by the Nebraska Hospital Association at its annual convention last month. The Meritorious Service Award recognizes the long-term contributions of members to the association and their individual hospitals. This award honors the longevity and breadth of service of individuals, not only to their facilities, but also to health care in the state. Dr. Richard Blatny Sr. from Jefferson Community Health and Life in Fairbury was also honored. Fraser joined Methodist Health System as executive vice president and chief operating officer of Methodist Hospital in 1991. He was named president and CEO of the hospital in 1997, a position he held until 2007, when he was appointed president and CEO of Methodist Health System. He held that position until Dec. 31, 2017, when he retired. During his tenure at Methodist Hospital, Fraser led the planning and construction of Methodist Estabrook Cancer Center, as well as Methodist HealthWest. He was also instrumental in updating and maintaining the facility's clinical technology, including a $20 million renovation of the entire hospital. In Fraser's time as the chief administrator, Methodist Hospital also earned numerous awards and certifications, most notably being awarded Magnet® status by the American Nurses Association Nurses Credentialing Center - the first hospital so designated in the state of Nebraska. 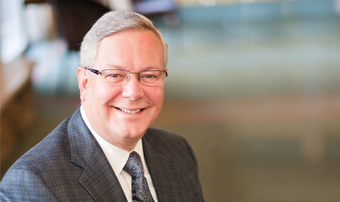 As president and CEO of Methodist Health System, Fraser was instrumental in the vision and construction of Methodist Women’s Hospital, successfully guided a $90 million renovation of Methodist Hospital’s surgical suites, saw Methodist Physicians Clinic expand clinic sites and specialty services, and helped the organization successfully navigate the ever-changing health care environment. Like so many leaders before him, Fraser was tasked with not only the day-to-day operations but also instilling the mission and culture to all those in the Methodist organization. For those who know Fraser, he lived it each and every day. Fraser's efforts did not go unnoticed. He was named to Becker’s Hospital Review list of top 130 CEOs to know in 2015, and he made the publication's top 183 hospital and health system list in 2017.